My name is Vikram and tea is my business. This has been our family business since 1954 and be sure to recieve a royal treatment when your friends and you meet me. 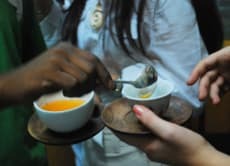 More than anything I love sharing my passion for the hundreds and thousands of varieties of tea which can be found across the Indian sub continent - Dargeeling Tea, Assamese Tea, Niligiri Tea or the evergreen Masala Chai (Tea) - you name it and I will be happy to enjoy my cup of tea with you. Come join me as I mystify you through a unique tea tasting event at your casa.